This week, we are joined by the mighty Rebecca Watson, co-host of The Skeptics' Guide To The Universe, and chief of all the Skepchicks. Need we say more? This week we twitter on about tweets, Barnaby, Morse, Cracker, Monk, The Shield, The Wire and Taz. 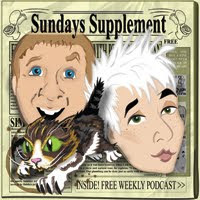 We also talk a bit about the Sunday supplements. This week Simon takes great delight in iszi's reaction to the images rushing through her head. And they have nothing to do with Lost, pandas, Stalin or the new Google application for the Blackberry. A much shorter episode this week, for reasons that will rapidly become apparent. Just a quick reminder that iszi will be performing Matter of Tact at the Leicester Comedy Festival on February 14th.